1. The website is owned, managed and operated by Pioneer Book Co. Pvt. Ltd.
4. Pioneer Book Co. Pvt. Ltd. may terminate User’s access to the website, or any part thereof, at any time and for any reason, without any notice. The provisions regarding disclaimer of warranty, accuracy of information, software, database other system or functionality of website and indemnification shall survive such termination. Pioneer Book Co. Pvt. Ltd. may monitor the User’s access to the website. 6. All contents on the website are the exclusive property of Pioneer Book Co. Pvt. Ltd., except the third party content. The software, text, images, graphics, video and audio used on the website belongs to or are licensed to Pioneer Book Co. Pvt. Ltd. or its subsidiaries and affiliates. No material from the website may be copied, modified, reproduced, republished, uploaded, transmitted, posted or distributed in any form without prior written permission from Pioneer Book Co. Pvt. Ltd. All rights not expressly granted herein are reserved. Unauthorised use of the materials appearing on the website may violate copyright, trademark and other applicable laws, and could result in criminal or civil penalties. You are granted a non-exclusive, non-transferable, limited right to access the website and shall avail the services provided by Pioneer Book Co. Pvt. Ltd. on the website . 7. Pioneer Book Co. Pvt. Ltd. does not make any warranties, express or implied, with respect to any service, information, data, software, system, functionality, statements or products made available on the website. The information contained in the website has been obtained from sources believed to be reliable. The website and all content, materials, information, software and services provided on the website are provided on an “as is” and “as available” basis. 8. Pioneer Book Co. Pvt. Ltd. does not warrant that the website will operate error-free or that the website and its servers are free of computer viruses or other harmful mechanisms. If your use of the website or content therein results in the need for servicing or replacing equipment or data, Pioneer Book Co. Pvt. Ltd. is not responsible for any such costs. Website and content are provided on an “as is” basis without any warranties of any kind. Pioneer Book Co. Pvt. Ltd. to the fullest extent permitted by law, disclaims all warranties, whether express or implied, including the fitness for particular purpose and non-infringement. Pioneer Book Co. Pvt. Ltd. makes no warranties about the accuracy, reliability, completeness or timeliness of the content, services, software, text, graphics and links. 9. Pioneer Book Co. Pvt. Ltd. shall not be liable for any damage to User’s computer system or loss of data that result from the download of any content, materials and information from the website or the use of any software, systems, functionality or other services on the website . Under no circumstances will Pioneer Book Co. Pvt. Ltd. be liable in any way for any content, including, but not limited to, inaccurate, false, incomplete, threatening, defamatory, obscene, offensive, illegal content infringement of other’s rights including intellectual property rights, for any errors or omissions in any content, or for any loss or damage of any kind incurred as a result of the use of any content posted or uploaded. Further, under no circumstances shall Pioneer Book Co. Pvt. Ltd. be liable for any unlawful act of the User or its affiliates, relatives, employees or agents including misuse of any data, unfair trade practices, fraud, cyber squatting, hacking and other cyber crimes. In no event shall Pioneer Book Co. Pvt. Ltd., be liable for damages of any kind, including without limitation, direct, incidental or consequential damages (including, but not limited to, damages for lost profits, business interruption and loss of programs or information) arising out of the use of or inability to use website, or any information provided thereon, or any claim attributable to errors, omissions or other inaccuracies in the website. 10. You may not send, submit, post or otherwise transmit, material or messages that contain software virus, or any other files that are designed to interrupt, destroy and negatively affect in any manner whatsoever, any electronic equipment in connection with the use of the website, or other user’s ability to use the website . 13. If the website provides links to web website s and access to content, products and services from third parties, including users, advertisers, affiliates and sponsors of the website you agree that Pioneer Book Co. Pvt. Ltd. is not responsible for the availability of, and content provided on, third party web website s or content. The User is requested to peruse the policies posted by other web website s regarding privacy and other topics before use. Pioneer Book Co. Pvt. Ltd. is not responsible for third party content accessible through the website, including opinions, advice, statements and advertisements, and User shall bear all risks associated with the use of such content. Pioneer Book Co. Pvt. Ltd. is not responsible for any loss or damage of any sort which User may incur from dealing with any third party. 14. By using any third party content, user may leave the website and be directed to an external website, or to a website maintained by an entity other than Pioneer Book Co. Pvt. Ltd. If you decide to visit any such website, you do so at your own risk and it is your responsibility to take all protective measures to guard against viruses or any other destructive elements. Pioneer Book Co. Pvt. Ltd. makes no warranty or representation regarding, and does not endorse, any linked websites or the information appearing thereon or any of the products or services described thereon. Links do not imply that Pioneer Book Co. Pvt. Ltd. or the website sponsors, endorses, is affiliated or associated with, or is legally authorized to use any trademark, trade name, logo or copyright symbol displayed in or accessible through the links, or that any linked website is authorized to use any trademark, trade name, logo or copyright symbol of Pioneer Book Co. Pvt. Ltd./Meri Saheliindia.com or any of its affiliates or subsidiaries. You hereby expressly acknowledge and agree that the linked website s are not under the control of Pioneer Book Co. Pvt. Ltd. and Pioneer Book Co. Pvt. Ltd. is not responsible for the contents of any linked website or any link contained in a linked website, or any changes or updates to such websites. Pioneer Book Co. Pvt. Ltd. is not responsible for webcasting or any other form of transmission received from any linked website. Pioneer Book Co. Pvt. Ltd. is providing these links to you only as a convenience, and the inclusion of any link shall not be construed to imply endorsement by Pioneer Book Co. Pvt. Ltd. in any manner of the website. a) Any other person sharing your username and password. b) Any part of the website being cached in proxy servers and accessed by individuals who have not registered with website as users. c) Access through a single username and password being made available to multiple users on a network. 16. If we reasonably believe that a username and password are being used/misused in any manner as clarified above, we reserve the right to cancel access rights immediately without notice, and block access to all users from that IP address. 17. You specifically agree that Pioneer Book Co. Pvt. Ltd. shall not be responsible for unauthorized access to or alteration of your transmissions or data, any material or data sent or received or not sent or received through the website. (i) threatens the unity, integrity, defence, security or sovereignty of India, friendly relations with foreign states, or public order, or causes incitement to the commission of any cognisable offence, or prevents investigation of any offence or is insulting any other nation. 21. The user hereby specifically agrees to comply with the requirements of the Information Technology Act, 2000, as also the rules, regulations, guidelines, bye laws and notifications made thereunder, while on the website. The user also undertakes that the content provided by him/her is not defamatory, obscene, threatening, abusive or hateful. The User shall alone be responsible for all his acts, deeds and things and that he/she alone shall be liable for civil and criminal liability there under or under any other law for the time being in force. 22. Pioneer Book Co. Pvt. Ltd. may, if you so choose, send direct mailers to you at the address given by you. You have the option to ‘opt-out’ of this direct mailer by way of links provided at the bottom of each mailer. Pioneer Book Co. Pvt. Ltd. respects your privacy and in the event that you choose to not receive such mailers, Pioneer Book Co. Pvt. Ltd. will take all steps to remove you from the list. 23. Pioneer Book Co. Pvt. Ltd. recognizes the receipt, transmission or distribution of spam emails (unsolicited bulk emails) as a major concern and has taken reasonable measures to minimize the transmission and effect of spam emails in its computing environment. All emails received by Pioneer Book Co. Pvt. Ltd. are subject to spam check. Any email identified as spam will be rejected with sufficient information to the sender for taking necessary action. With this measure, along with other technical spam reduction measures, Pioneer Book Co. Pvt. Ltd. hopes to minimize the effect of spam emails. Pioneer Book Co. Pvt. Ltd., reserves the right to reject and/or report any suspicious spam emails, to the authorities concerned, for necessary action, from time to time. 25. The website is controlled, operated and administered by Pioneer Book Co. Pvt. Ltd. from its offices within India. Pioneer Book Co. Pvt. Ltd. makes no representation that materials on this website are appropriate or available for use at any other location(s) outside India. Any access to this website from territories where their contents are illegal is prohibited. You may not use the website or export the materials in violation of any applicable export laws and regulations. If you access this website from a location outside India, you are responsible for compliance with all local laws. Print copies are sent by the Indian Postal Service/Approved Courier Services. For overseas subscription, copies are either sent by Airmail or Sea-Mail, whatever mode has been subscribed to. 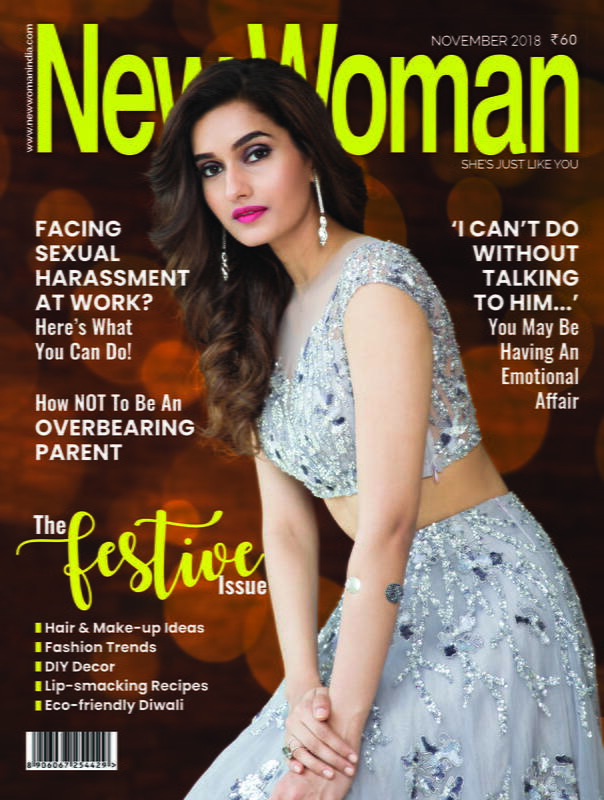 Access to www.Newwomanindia.com is either by username and password for individual subscribers and by IP Authentication for institutional subscribers. Refunds for Subscriptions are given on a pro-rata basis on the remaining term after one full month has lapsed. The amount refunded is calculated after necessary deductions have been carried out on the principal amount. For payments made by cheque, we shall issue a cheque. For online payments refunds can only be made to the credit/debit/charge card that was used for the original purchase. No refund will be possible for payments made by net banking/credit/debit card or other online modes after 90 days from the date of transaction. All refunds are at the discretion of Pioneer Book Co. Pvt. Ltd.
“the magazine”(Newwomanindia.com). To cancel your subscription, please email us at [email protected], or write to us at our postal address with the details of your payment. If more than half the subscription period has lapsed, then no refund would be payable.